This fun and funky bookmark will hopefully bring some colour to your reading time! A lovely little gift for someone of any age, who loves books. The bookmark is double sided so is very thick and robust. On one side the design features a close up illustration of a watermelon and on the other side there are three smaller melons, all against a vibrant green background. 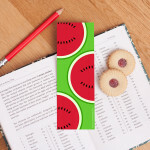 Be the first to review “Watermelon Double Sided Bookmark” Click here to cancel reply.